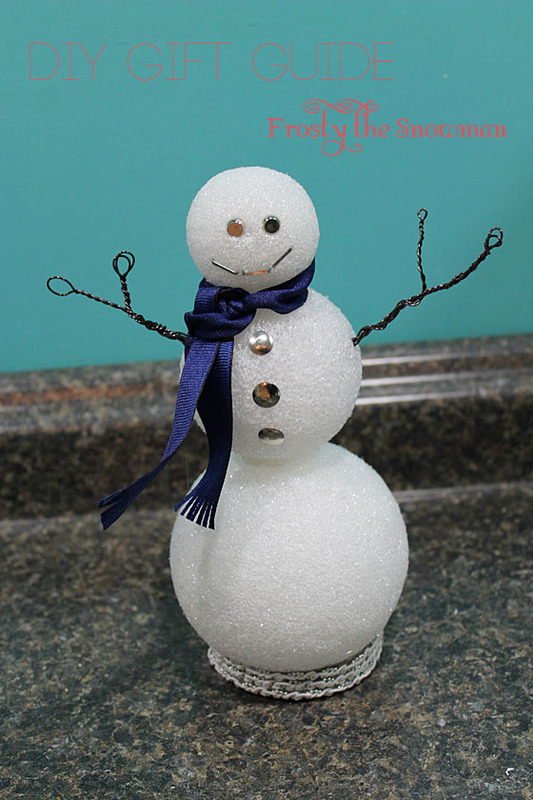 Day 4 of the DIY GIFT GUIDE series brings us this adorable snowman ornament. 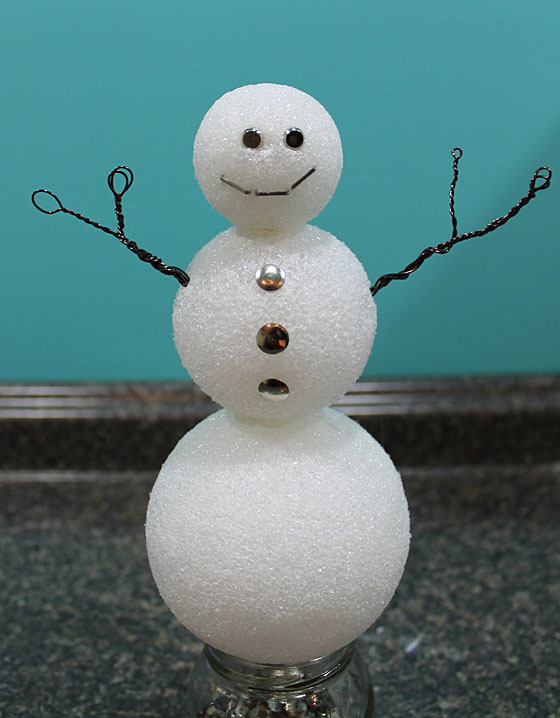 If this guy doesn’t belong on your Christmas tree, I don’t know what does. Cut a long piece of wire and bend it in half. Feed it through two holes of a white button. 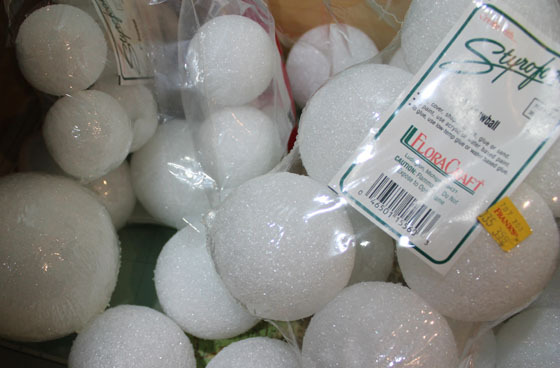 This will secure the styrofoam balls to the wire. 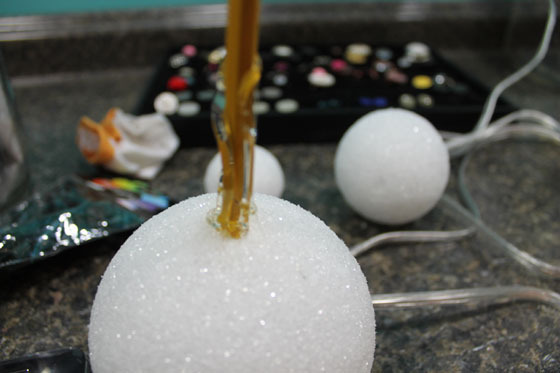 Feed the wire through the largest of the three foam balls. 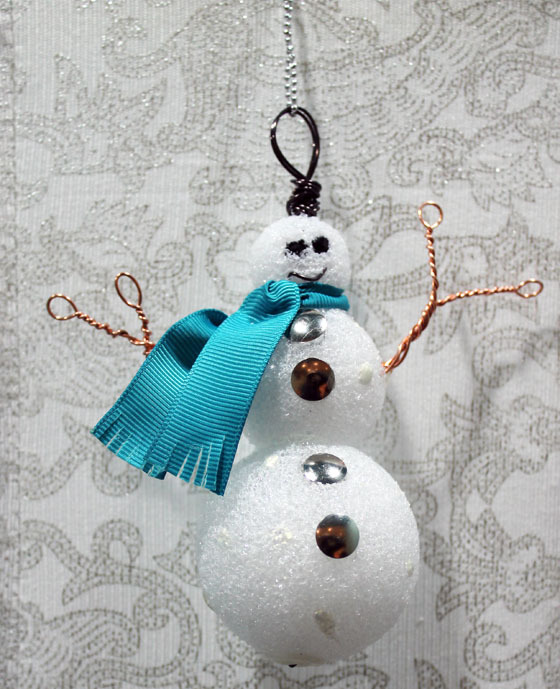 Try to get the wire to go straight through the middle so the snowman isn’t off kilter. Stack the remaining two balls on top of the first with the medium ball next and the smallest ball on top. 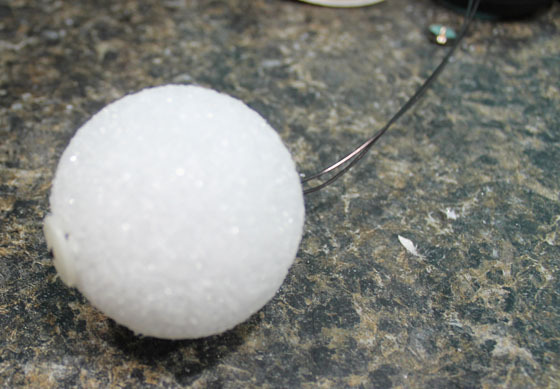 In between each ball, place a small bit of hot glue on the wire to keep the ball secure once it is in place. 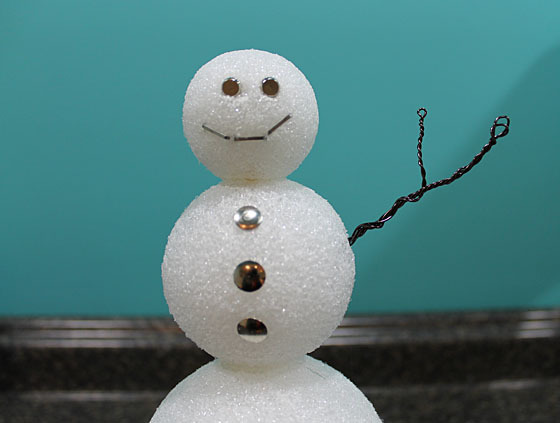 When the snowballs are assembled, secure them at the top by making a wire loop, then wrapping the remaining wire around the base of the loop. 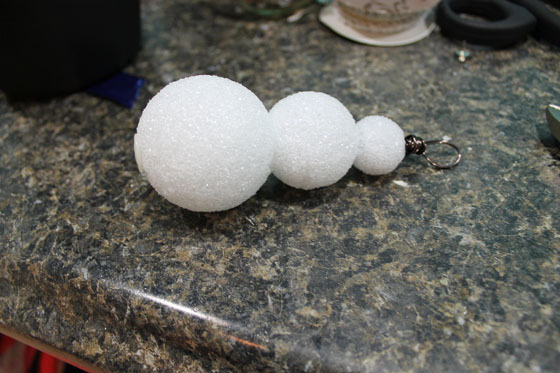 Add a thin ribbon here to hang the ornament. 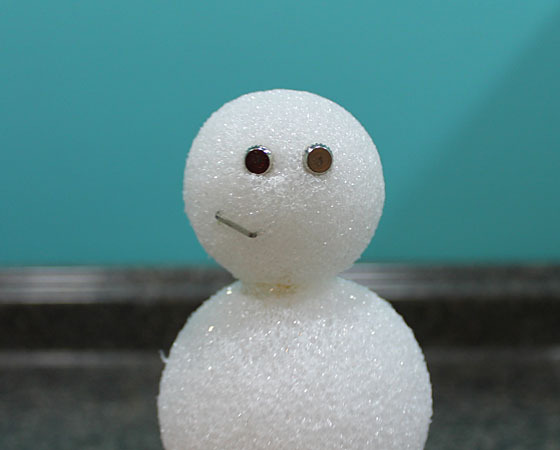 Next, create the snowman’s face by firmly pushing two black beads into the styrofoam for the eyes. I used faceted beads, not round beads, thinking they’d stay in better. For the mouth, take a small pice of craft wire and bend it into a smile. Then, form 90 degree bends at the end of the smile and push it into the styrofoam. 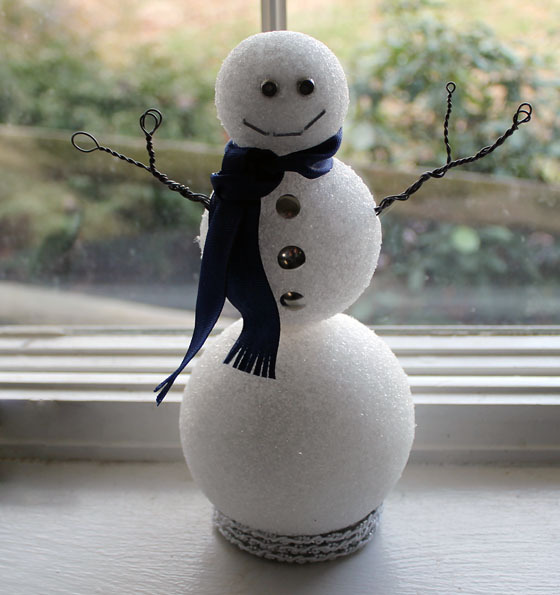 For the buttons, take silver tacks and stick them into the styrofoam to act as buttons. 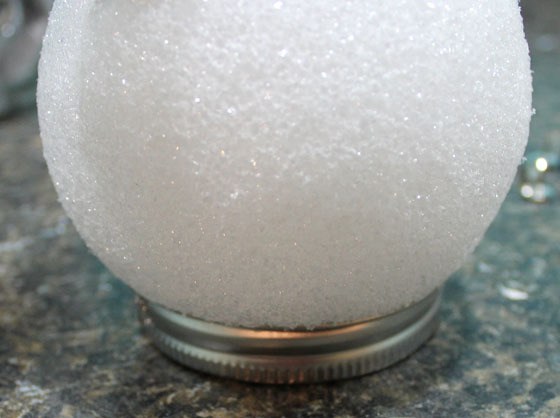 Place a dab of hot glue under each one so they don’t loosen and fall out over time. The scarf is next. 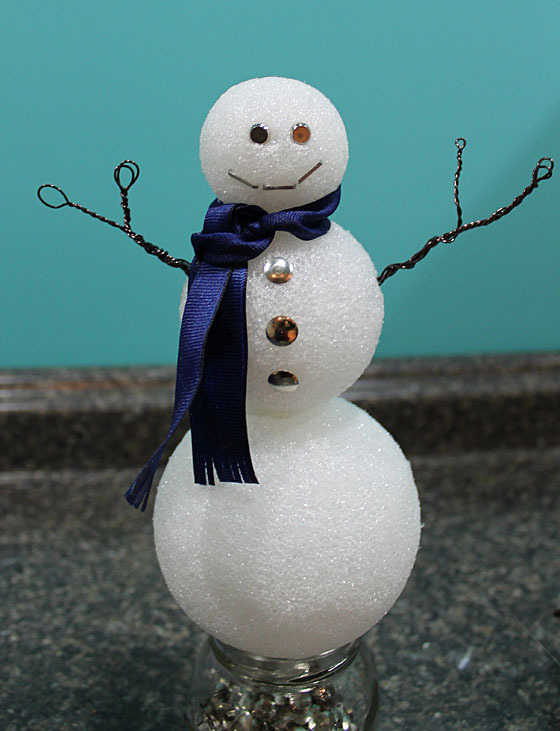 Find a thick piece of ribbon and tie it around the snowman’s neck. Then, take scissors and “fray” the end of the scarf by cutting small slits. Use no-fray to seal the ends so the ribbon doesn’t unravel. 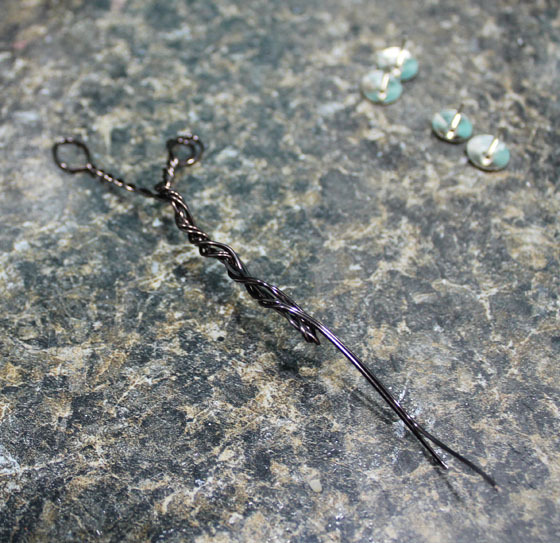 Take a long piece of wire (12″) and fold the wire in half. Twist the wire until it is 1/3 of the way twisted. Then, take the straight wire and wrap up the twisted portion. When the wire reaches an inch from the top, start twisting again. This will form the two forks in the arm. When both forks are twisted, wrap the remaining wire down the base of the arm, then stick the wire bottom into the styrofoam. Secure with glue and repeat. 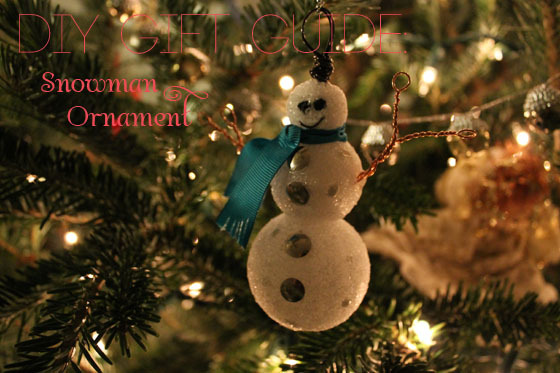 Hang snowman ornament on tree! 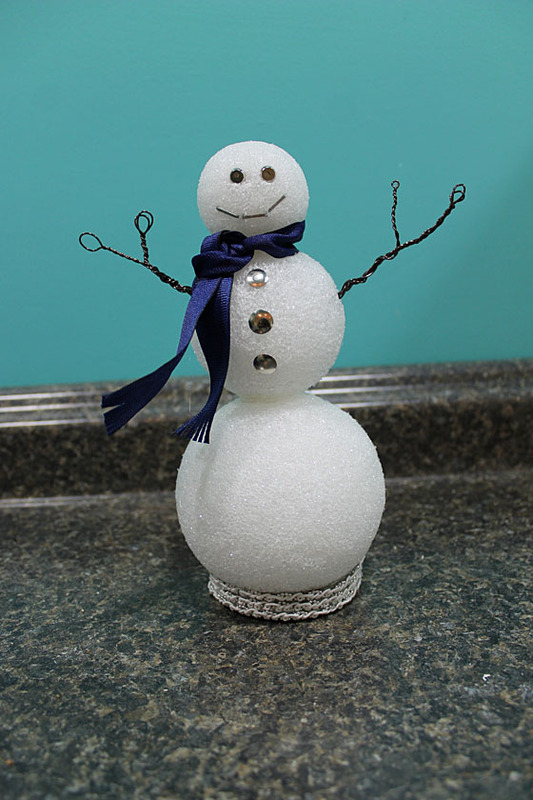 Check back tomorrow for another DIY GIFT GUIDE post! Hope you are getting some good holiday gift inspiration.